2018This series of refined publications which shows the ancient wisdom of our country with both traditional and modern characteristics, is beautifully illustrated and designed by Chinese freelance illustrators. 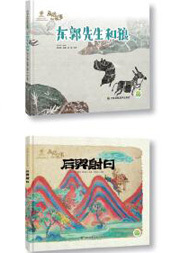 This series of refined publications which shows the ancient wisdom of our country with both traditional and modern characteristics, is beautifully illustrated and designed by Chinese freelance illustrators. Magically they become bedtime books that will calm and comfort children in the evenings.